As I’m trying to tie up the loose ends on my university supplies, stationary and halls items, it occurred to me I hadn’t drawn up a list of Magickal tools I’ll need. I can’t take everything, and there are a lot of books I will have to leave behind until Yule. I will only take the most important items, also noting that I may buy other items when I’m there as well. What items would you take with you? I’ve asked a few folks over the past few weeks, and the responses have been diverse. I’ve had time to think and thought I’d share this written mishmash of ideas! It’s been a long time coming! I am only taking two of my thirty decks. 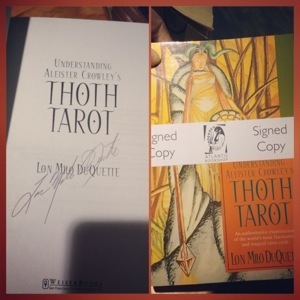 The “Lo Scarabeo Tarot” and Crowley’s “Thoth Tarot”. The Lo Scarabeo tarot is a modern merging of three of the worlds most popular tarot, with beautiful Italian illustration and simple symbols. It’s a deck that is comprised of the Rider-Waite, Tarot de Marseilles and Thoth. 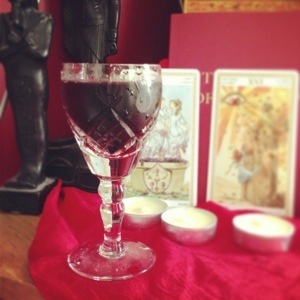 I use this deck as one of my daily/weekly tools for personal divination. It may come in handy with a few students too. As for my beloved Thoth deck, it’s only used for the odd reading, meditation and Qabalah study. As far as books are concerned, they have been the main area of interest and inquiry. Partly because they are tomes of knowledge and I will miss them if they aren’t around for me to study from. Mostly because the house I’ll be leaving them in is heaven for the ignorant and closed minded – I would die if my aunt decided to hide or destroy them, like a few of my old ritual items from times past. My original plan was to take the smaller version of Liber ABA – Regardie’s “Gems…” As it includes everything I need to know in a more immediate fashion, but I’m just too attached to my blue baby. So below is a small list of a few important books I’m taking, baring in mind I can change them every three months or so until I get my own place the following year. All of my journals are coming with me! I write in them so damn much I’m already about to start my next brand new Moleskine for Conjurations and thoughts. Write! And write often folks! Now, I don’t know all the rules of my halls yet so I’m not risking candles, my dagger or wands etc. however, I shall take a particular number of altar cloths to create scared space, and possibly a statue or two. I’ve moved from the stage of having a statue to represent deity in order to worship it, as my view of deity is that of the New Æon. I will also have a small vase with a fake red rose – hayfever issues. I will take a few crystals to keep balance, and my pink yoga mat! If there is a yoga class at the gym then I’ll be going, if not I’ll find one somewhere in the city – need to keep toned and spiritually connected yo’! I’m sure there is much more I could take, but I will see. My travel altar items need a massive reshape too! Like I said, what would you take with you and why? So many people have so many different paths and experiences, and differing reasons for particular items. What keeps you spiritually connected? Let me know below. Categories: Annoying Thoughts, Books, Daily Devotions, Divination, Fun, General, Lessons in Life, Magick, Meditation, Occult, Paganism, Solitary Witch, Thelema | Tags: items, Magick, packing, religion, Spirituality, Thelema, Tools, university | Permalink. I’m still here!! I have a new phone and a ton of things I want to publish. The annoying thing is the touch screen! I’m so used to blogging on my old blackberry phone and then emailing it over to my main email. From there I use the iPad to copy and paste onto the WordPress app. So I’m not gone! Technology is trying to inspire me to blog using telepathy or at least the light touch of my fingers. As for blog posts and still being here, I am super busy with college. I love college so much more each day. I have applied for universities across the south east of England so I don’t have to travel too far from London. Apart from that j am also trying to sort out my official status within the world of Thelema. Keeping my fingers crossed! Work has been getting worse by the day. Busy all the time and the nurses only seem to be nagging us to do more. So I’m in the market to find a different job so I can get away from sofa surfing. Earning minimum wage seriously stinks for the amount of hours I put in, but like they say, you have to make sacrifices if you want a brighter future. So far, being homeless, stressed, having horrid shaped eyebrows (they are on strike from all the threading 😜) and never having a day off is getting too much. I am keeping my head up though! S’all good! I bought a few new bits and bobs and picked up a new Thoth Tarot book to continue my study of the tarot according to Crowley. Bare in mind I have been reading cards via tarot and cartomancy since I was a preteen, so the Thoth tarot is something I am focusing on more this year with the main meanings rather than the general. My videos have gone in a different direction—slightly. I used to complain about being lonely in my path and complain about the amount of crap within the pagan Youtube community and one day I decided to ask the gods for advice. I basically asked them to remove me from that part of the community and only guide me toward people who I can learn genuine truths from. So far my wish has come true. I have met some of the most amazing people ever! All very helpful and kind. They see how passionate I am about my study and practice and so they have come forward to help me focus more. Thank you brothers and sisters (to be, fraternally). The other change, now that intellectual individuals are finally coming my way, is the slight change in video format. Due to having a new phone I can’t just note down ideas quickly like I used to; at least not yet. So I keep my main camera in my bag so I can vlog as and when an idea arises. Over the space of a week I will render the footage to create a week vlog or a vlog covering events over a few days or something. It won’t be all the time, just a few here and there to start with. I’m saving for a new MacBook too, so in time I can use iMovie and Final Cut Pro again. Better quality videos with better editing. So that’s all for now, I just need to complete a questionnaire from Annika (OathBoundSecrets) before I lay my head to sleep. I’m opening up more about my outlook on spirituality, and hoping to be able to learn more about myself in the process. I’m not a teacher, I’m just a young woman trying to record her growth so I can look back on my life. Thank you, and lots of love. Categories: General | Tags: Sy Calaelen | Permalink.